The journalist Xiaogang Cao was recently invited to visit ASICMiner’s immersion cooling mining facility, in Hong Kong, and shared his experience on the Bitcointalk.org forum, where he published several pictures. The structure has existed since August 2013, when ASICMiner’s founders “purchased the best cooling machines and pumps from China”. According to Cao, the mining facility is located in an industrial area and is “composed of dozens of standard racks you can find in every common data center. Each rack contains three sealed liquid glass tank, blades are all operating quietly in the liquid, while switchers hanging above”. The journalist adds that all the machinery is surprisingly silent. 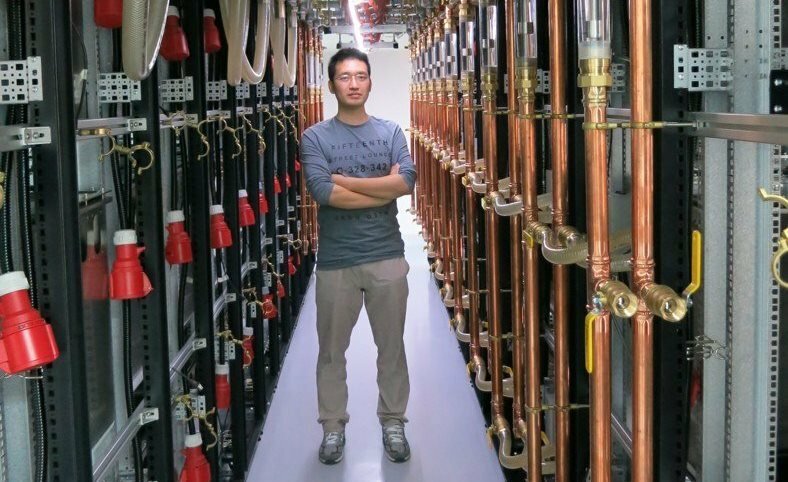 The visitor reports that Alex, the host at ASICMiner, told him that this immersion cooling technology has been under development for years. He also showed me a prototype liquid tank, it was build for ASICMINER for test purpose. The first version of Block Erupter Blade had many external interfaces, equipped with a heat sink, with a large size, designed for air cooling. Now the new Blade PCB have been greatly improved in order to optimize liquid cooling results, PCB is reduced in height, this can use less liquid. In fact, this cooling technique is one of the most advanced on the planet. A similar technique is applied for super computer systems. Through the usage of immersion cooling, calculating density can reach far beyond air cooling system. At present, each liquid tank can accommodate 92 blades, but it could be more in the future. Each 200cc liquid can afford up to 4kw mining power. Each cooling pipe can afford the power consumption of the 25kW, a liquid tank can support four sets of cooling pipes. “In the Bitcoin world, time is everything”, Cao writes, so in order to speed up the deployment process, the system uses mainly common equipment. “After liquid and mining equipments loaded, each tank weighed about 200 kilograms“, he adds. But instead of using expensive guide rail fixed to the rack, they coated the tank bottom with Teflon material, generating very small level of resistance. This system inherit the character of practical, simplified, low cost high performance of friedcat have been pursued, all this is designed for fast and large scaled deployment. The tank is no pressure vessel. When I touched the outer wall of the liquid tank,feel no higher than the body temperature. Alex showed me his iPhone, a monitor App can display the room temperature , liquid conduit entrance temperature and the outlet temperature, all read below 37 degrees. The liquid made by 3M, it is very expensive, it’s not only impossible to get fired, and itself is excellent fire extinguishing material. You can find them in every major financial data center , the fire-fighting systems use the same liquid. Low-temperature,no-pressure,fire-prevention materials, These make the mining facility have incomparable safety level. Although the current technology is quite innovative, Cao reveals that only a fraction of the facility is operating, while some racks are still waiting. Trying to guess, he says that they could be “waiting for the next generation chips”.